We know the water - we know the fish! At Island Tides Fishing Lodge we have over 20 years of freshwater fly-fishing experience on Vancouver Island off the west coast of British Columbia, Canada. This Vancouver Island fishing experience, combined with our own love for the sport of fly fishing, means our Vancouver Island fly fishing vacations offer fly fishing enthusiasts an experience that is second to none. Picture rafting down a crystal clear Vancouver Island river or fishing a pristine mountain lake; casting to hard fighting wild Pacific Salmon, Trout or Steelhead eager to take a fly. 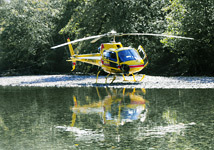 Imagine flying by helicopter into some of Vancouver Island’s most remote rivers; short on crowds and big on big fish. 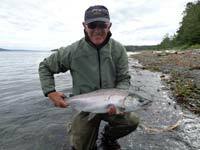 The experienced fly fishing guides at Island Tides BC Fishing Lodge have done it all and will take you to some of the hottest Vancouver Island fishing spots. Contact us for more information. Rivers, lakes, streams, steelhead, 3 species of trout and all 5 species of Pacific salmon set in incredible West coast BC scenery: it's all here waiting for you on Vancouver Island, British Columbia! We can customize your Vancouver Island fly fishing vacation to combine several of the above fly fishing adventures into one fantastic all inclusive BC fishing vacation that will fulfill your preferences in fly fishing. All of our fly fishing adventures are well suited for the experienced angler or for beginners who are just getting started in the art of fly fishing. Whatever your skill level is, our BC fishing guides will ensure that you have a BC fishing vacation that will meet or exceed your fly fishing expectations. (Our professional, qualified BC fishing guides will provide fly-casting instruction and proper fishing techniques for the beginning fly fisher). On a Steve Shelley fly fishing adventure you will enjoy fishing some of Vancouver Island’s most pristine rivers, where human footprints are seldom seen. Enjoy a gourmet shore lunch, take in the breathtaking Vancouver Island scenery and experience some fantastic BC fishing! At the end of the day you can relax and enjoy the west coast hospitality at our river front fishing lodge with outstanding meal service and first class accommodation. Fly fishing just does not get any better than this. At Island Tides BC Fishing Lodge we can customize your Vancouver Island fly fishing vacation from 2 to 7 days in length (or more). 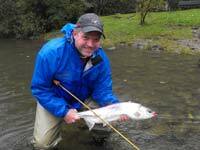 For more information on customizing your freshwater fly fishing vacation, please contact us. All you have to do is show up and we will take care of everything else, leaving you plenty of quality fishing time to reel in the fish of your dreams. 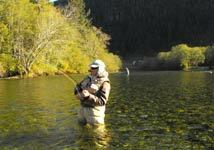 Please contact us to help make your Canadian all inclusive fly-fishing vacation to Vancouver Island worry free. Experience the ultimate in fly-fishing adventures combined with the thrill of the flight! Fly above some of the most breathtaking scenery in Canada on your way to Vancouver Island’s most remote and wild rivers. These renowned fly fishing rivers are teeming with ocean bright salmon, ready and willing to take a fly. No crowds here. Relax and enjoy the flight as our experienced and professional pilot flies you from the fishing lodge in the morning to spend the day fishing some of the very best rivers on Vancouver Island, BC. Enjoy a gourmet shore lunch, incredible scenery and some of the best fly fishing in British Columbia. Please contact us for more information and pricing on organizing your Heli Fishing Adventure of a lifetime. We can also customize a BC fishing package that would include a day or two of heli fishing combined with one of our regular freshwater fly fishing packages or BC salmon fishing charters. Please see our freshwater Freshwater Fishing Rates page for more information. Considered the hardest fighting game fish on the West coast. If you like all kinds of fishing we suggest you combine our BC fly fishing charter with our BC salmon fishing and BC halibut fishing charter for a “Grand Slam BC Fishing Charter”! Only at Island Tides, your full service BC Fishing Lodge! Please contact us for more information. It's all here waiting for you on Vancouver Island, British Columbia, Canada!